Ängsruta - klingt das nach Ikea? Na klar. Ängsruta ist schwedisch und bezeichnet die Gelbe Wiesenraute. 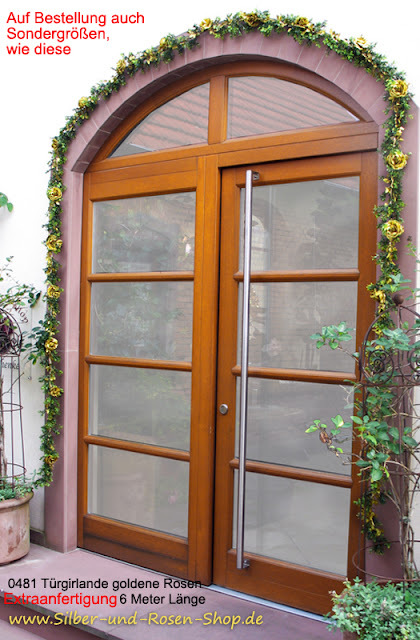 Ich finde jedoch, das Stoffmuster erinnert eher an Kirschblüten. Jedenfalls habe ich aus dem Stoff Tischläufer genäht und zwar mit der Hand. Mir gefallen vor allem die Couvertecken. Ängsruta - does it sounds like Ikea? Sure. Ängsruta is Swedish and means the Yellow Meadow Rue. However, I think the fabric pattern looks more like cherry blossoms. Anyway, I sewed from a fabric table runners and seemed it by hand. I like especially the envelope corners. Natürlich habe ich diese Teestunde damit gedeckt. Ich habe diesmal das Geschirr gemischt, was so an blau weiß vorhanden war. Das gelbe Gesteck bringt Farbe auf den Tisch. Of course I have used it for this tea table. This time I mixed the dishes, which was as available in blue and white. The yellow flower arrangement adds color to the table. Dann habe ich mich an die Häuschen erinnert, die passen ja auch dazu. In eines der Vasenhäuschen passt auch ein schlanke Kerze. Die anderen halten blühende Kirschzweige und die große Spardose steht einfach so dabei. Blühendes Amsterdam. Then I remebered the little blue houses that fit so well to it. In one of the house vases fits also a slim candle. The others hold flowering cherry branches and the large money box is just so here. Blooming Amsterdam. Ich habe heute einen kleinen herzhaften Snack zum Tee. Ich hoffe, das gefällt euch auch. Wie wird bei euch Ostern aussehen? Ich bin schon am Überlegen, was ich koche und wie ich decke. Es geht alles wieder so schnell. Today I have a small savory snack for tea. I hope that you like it too. What will you do on Easter? I'm already wondering about what I cook and how I cover. It all goes back so quickly. Danke dir für deinen Besuch und einen Kommentar. Thank you so much for your visit and a comment. I love the fabric pattern. 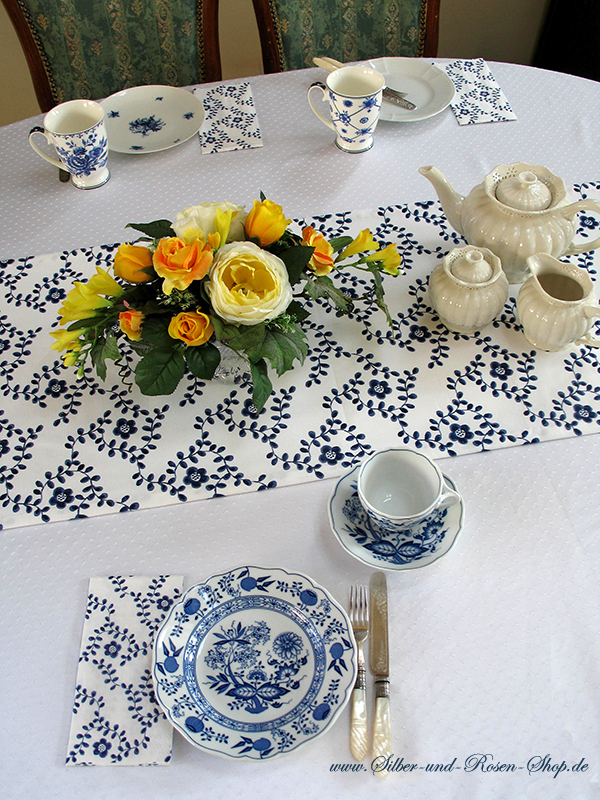 So springy :-) The yellow flower is perfect on the blue and white table. How beautiful! You have hand sewn those placemats in a meticulous way! But than, have we ever seen anything mediocre coming from your hands? Lovely place setting for a hearty tea. Great photos and styling. Oh, how I dream of springtime! The Island, and indeed all the Atlantic provinces, are expecting a monster snow storm/blizzard tomorrow with mountains of snow and hurricane strength winds. So, there will be no sign of posies in our gardens here for some time yet. How pretty your tea table looks both with the yellow flowers but especially with the houses! Your snack looks delicious and the egg cooked in a heart shape is so appealing. Cheese, bread, and an egg; yummy! Thank you for sharing at Tea Time and have a wonderful week, my friend. 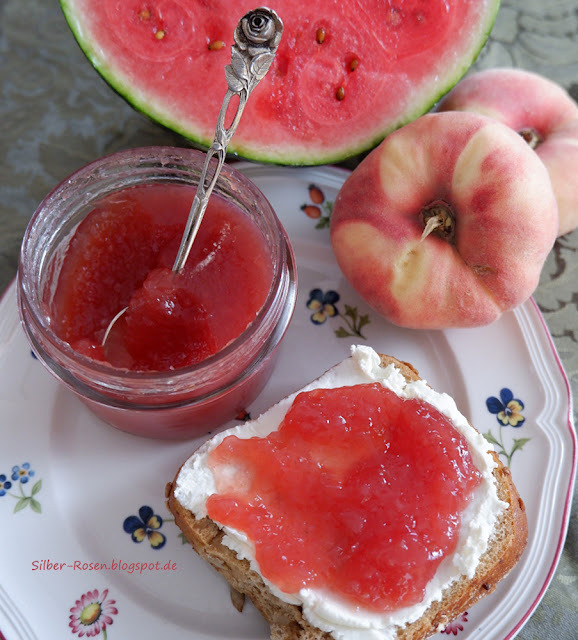 der Tischläufer ist wunderschön geworden.Hatte gleich Holland im Kopf ;) Den Tisch hast du wieder einmal so schön dekoriert mit den Häuschen und den Blümchen.Ist noch ein Plätzchen frei für mich ? Mmmhhh und ein herziges Spiegelei ... lecker mit Käse und Brot. Your newest handmade table runner is stunning! It looks so fresh and gorgeous! The table is totally cheery. You are having my favorite tea...eggs, toast and tea! I hope you are doing really well and that spring is showing up beautifully in your area. So nice to see you, and your tea table is gorgeous! 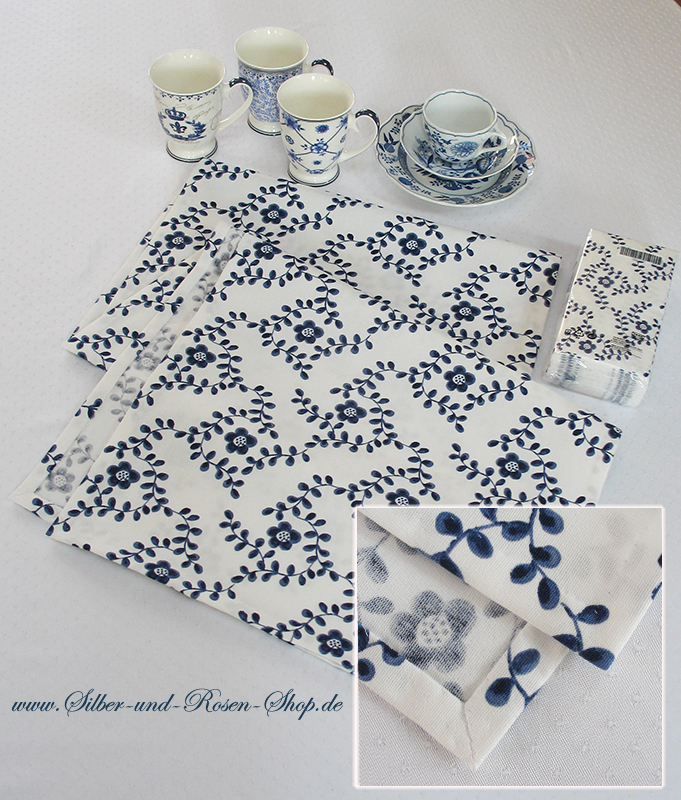 You were always so wonderful at this and your Hutschenreuther blue and White is lovely, along with the reticulated tea set...(I have them too) The material in the blue and White is very pretty and as a runner it looks lovely against the white. 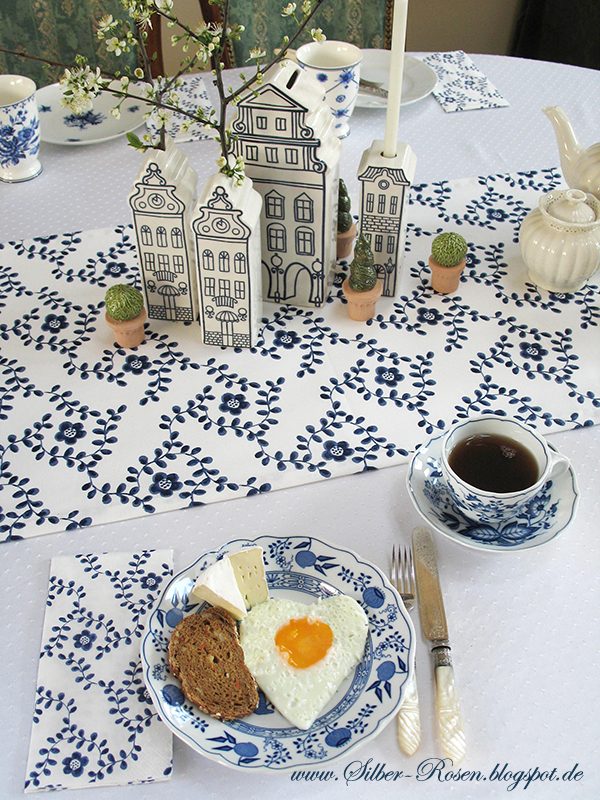 Adorable centerpiece with the skinny Dutch houses. The food looks yummy too! Big hugs and take care. Beautiful, Johanna! I love the fabric. It looks so crisp and fresh. 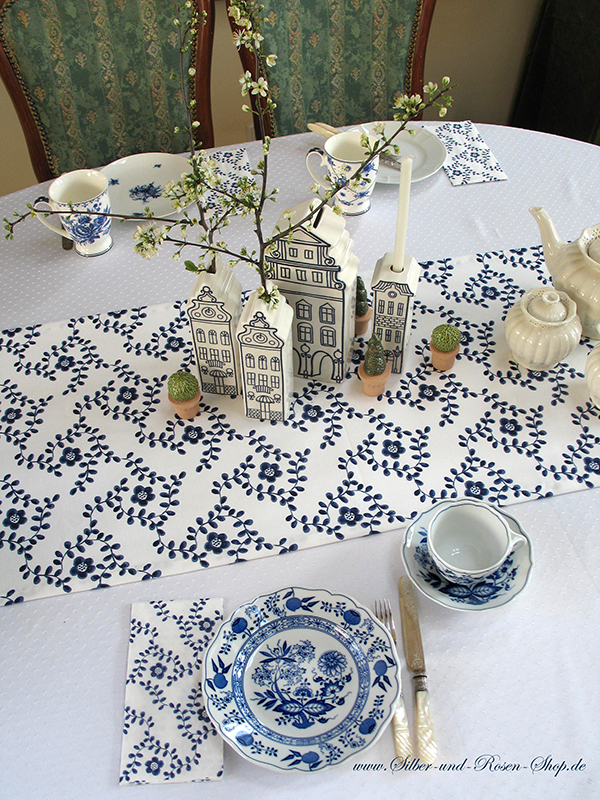 The blue and white houses make a perfect centrepiece too. Have a wonderful week. There are those darling little houses again on the table - they are so cute! Your egg is very interesting. Your sewing looks so perfect! Love it all! So glad you shared at Friends Sharing Tea Johanna. Lovely! I've been admiring the little blue and white houses in your headers. They are adorable on your table. They remind me of Molly Hatch's work. Liebe Johanna. Bei Dir möchte ich gern mal Gast sein. Da wird die gedeckte Tafel schon zum Erlebnis. Du hast so prima Ideen. An Ostern denke ich noch gar nicht. Hach, immer dieses Gekoche und Gebacke, wer kommt wann zu wem usw. Artet doch eher immer in Stress aus als dass man die freien Tage genießen könnte. Das sieht alles sehr hübsch aus ! Bei uns sind solche schönen Tischdekorationen leider völlig aus der Mode gekommen. Die Leute werden immer fauler. So Kaffeekränzchen gibt es in Belgien auch nicht. 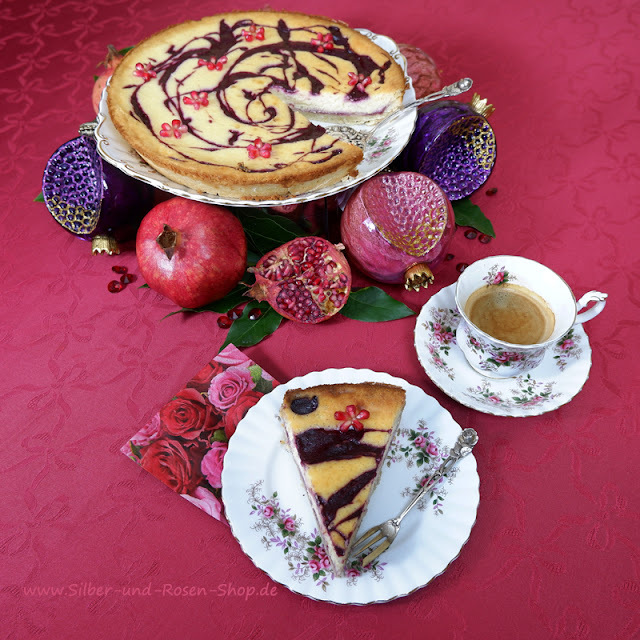 Kaffee wird nach dem Essen getrunken und Kuchen als Nachtisch serviert.Genau wie in Frankreich und Italien. Arthur dankt für die Geburtstagswünsche !